We are looking for a superstar Kitchen Coordinator/Cooking Class Assistant. Click here for the full run down on the position. If you are interested, please send your resume to kate@csnn.ca by Friday, May 10th. For every good quality, non-GMO item donated at the CSNN Vancouver branch, you will receive an entry to win a Fall Holistic Culinary Certificate registration or a gift basket full of local items. We made a number of changes to the aesthetics of the school over the summer including a fresh coat of paint, added some beautiful plants and art, moved the library into the office area to allow all students more access to the books available, and added a fridge and toaster oven for students to use. We are putting in the finishing touches over the next couple of weeks and will post pictures once everything is complete. I can’t wait to share it all with you! Well it has been two months since I officially took over as owner of the Vancouver branch. Things are just starting to settle down and I am excited to move forward with ideas I have for the school. One project coming up is painting the classrooms and administration area. This will be taking place the first few days of August once classes finish for the summer. Can you believe we had the less than 2 mm of rain all of May?! We were definitely blessed with some amazing weather. Of course when choosing the best back garden clean up date, we picked one of the rainiest days in April! We are excited to transform our back patio area into a space that students can utilize more often. The next stage is happening in a couple weeks when we move in the picnic tables! We recently made use of our beautiful space by hosting a farewell gathering for Judith. We are looking for Kitchen Assistants to join the team for our 2018/2019 school year. Click here for the full run down on the position. If you are interested, please send your resume to kate@csnn.ca by Monday, May 7th. Sara Gebriel, R.H.N. spoke with Minelle Mahtani on Roundhouse Radio’s Sense of Place. They chatted about the school, our program, and what a Registered Holistic Nutritionist™ professional does. Have a listen here! At June’s networking event, we welcomed Jamie Lee Mock, R.H.N. and Shae MacLean of Moonbrew Tonic Co. as our guest speakers. We started off with a taste test of three of Moonbrew Tonic Co.’s amazing flavors. Lavender Lemonbalm, Lemon and Elderflower, and Wild Rose Rooibos. For those of you who haven’t tried or even heard of jun before, I highly recommend it. Jun is a fermented health tonic similar to kombucha, but made with a jun scoby and honey instead of sugar. I would describe it as being much lighter than kombucha, less tart, and the honey gives it a much broader flavor. Using local ingredients is extremely important for Moonbrew. They source all of their ingredients from local farmers or they are out there wild foraging themselves. The ladies spoke of the importance that we as consumers purchase honey from local, trustworthy sources. Imported honey can contain up to 50% corn syrup! Yuck! We then went through a five-minute meditation that focused on the third eye chakra and intuition. So far intuition has played a big part in the growth of Moonbrew Tonic Co. Jamie Lee and Shae spoke about trusting your intuition when things come your way. They have also found that the more you talk about your passions, the more opportunities and connections come your way. Thank you, Jamie Lee and Shae, for providing such an inspiring event! To buy a bottle (or two, or three…) of Moonbrew Tonic Co.’s delicious jun, visit their website. Or if you are inspired to make your own, these lovely ladies sell all you need to get started. Send them an email for more information. Stay tuned for the next networking event date. At May’s networking event, we welcomed Dr. Cathy Sevcik, ND as our guest speaker. Dr. Cathy spoke to us about systemic inflammation, food intolerance, and digestive health. She went over how systemic inflammation begins in the gut. Although it can present in many ways (brain, skin, respiratory, circular, glands, digestion, hormone imbalances, musculoskelatory, immune system, etc.) 70% of your immune cells are in your digestive tract. When enzymes are sufficient only indigestible material enters the colon, promoting good bacteria. When large amounts of macronutrients enter the colon, bad bacteria prosper. Undesirable microbiome then excretes metobolites that are toxic and interfere with function throughout the body. We all know that allergy testing can be expensive. Dr. Cathy uses a method that is far less expensive and she feels provides the most accurate results. This method is called the Carroll Food Intolerance Test. During this test, a blood sample plus vials of specific foods and food combinations are placed on a device with an electric current. Foods are identified as weak or strong by the practitioner using acupuncture points. Thank you, Dr. Cathy, for being such an amazing guest speaker! To find out more about Dr. Cathy’s work or the Carroll testing, visit her website. At April’s networking event, we welcomed Kindi Gill, transformation coach, professional speaker, and founder of Spark Expansion, as our guest speaker. Kindi spoke to us about overcoming fear by taking conscious action. The definition of fear is an unpleasant emotion caused by the belief that someone or something is dangerous, likely to cause pain or a threat (whether real or imagined). The response that drives fear is driven by our unconscious belief. Unconscious bias refers to a bias that we are unaware of and which happens outside of our control. It is a bias that happens automatically and is triggered by our brain making quick judgement and assessments of people and situations, influenced by our background, cultural environment, and personal experiences. Kindi took us through a great partner exercise to help us vocalize our fears and awaken the ability to express ourselves. Thank you, Kindi, for being such an inspiring guest speaker! To find out more about Kindi’s work visit her website. At March’s networking event, we welcomed Gina Vanderham, Psychotherapist and Workplace Consultant, as our guest speaker. Gina took us through the seven types of hunger with a mindful eating meditation. 1. Eye Hunger – To satisfy eye hunger, we can really feast our eyes on the food before we put it in our mouths. If we mindlessly stuff our dinner in our mouths while watiching TV, we’re wasting on opportunity to really appreciate it. 2. Nose Hunger – To satisfy your nose hunger, practice sensitising yourself to the smell of your food, isolated from taste, by taking a pause before eating to really take in the aromas. 3. Mouth Hunger – What we think of as tasty, appealing food is often actually socially conditioned or influenced by our upbringing. Generating greater awareness and a sense of open curiosity around the flavours and textures in our mounths as we eat can help satisfy our mouth hunger. 4. Stomach Hunger – Listen to the stomach’s cues and start to familiarize yourself with them. Try delaying eating when you feel hungry and become aware of the sensations. Assess your hunger on a scale of 1-10 before a meal, then halfway through check in again and do the same. 5. Cellular Hunger – This is one of the hardest types of hunger to sense even though it is the original reason for eating. Through mindfulness it is possible to become more aware of our body’s cravings for specific nutrients and to bring back some of the inner wisdom we had when we were children. 6. Mind Hunger – The mind is very fickle and will find something new to focus on if one craving is satisfied. Mindfulness can help calm the mind and allow for a more sensitive awareness of the other cues our body is sending us. 7. Heart Hunger – To satisfy our heart hunger, we need to find the intimacy or comfort our heart is craving. Try noticing the emotions that you’ve been feeling just before you have an urge to snack and you might be able to find other ways to satisfy them, such as calling a friend or having a cup of tea or a hot bath. One thing I took away from the meditation was that I am often distracted when I eat. Whilst sitting and eating my food, I noticed that I was itching to do something else at the same time. I had to almost force myself to remain focused on what I was eating. If you do not already eat mindfully, I encourage you all to give it a try. What you experience may surprise you. Thank you, Gina, for being such a great speaker! 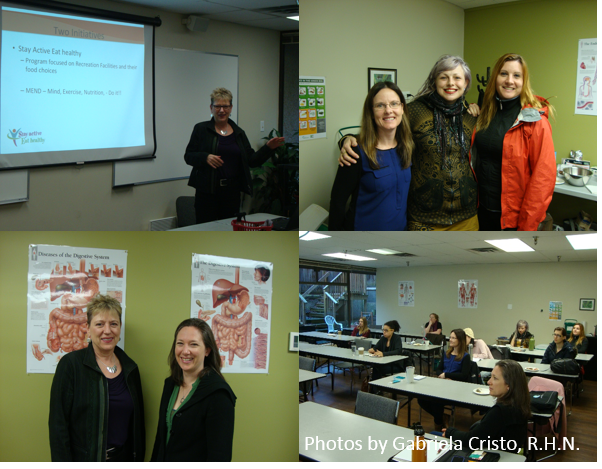 At February’s networking event we welcomed Andrea Potter, Registered Holistic Nutritionist™ professional, Red Seal Chef, and CSNN Instructor, as our guest speaker. This networking event took place in the CSNN demonstration kitchen for some hands-on learning. 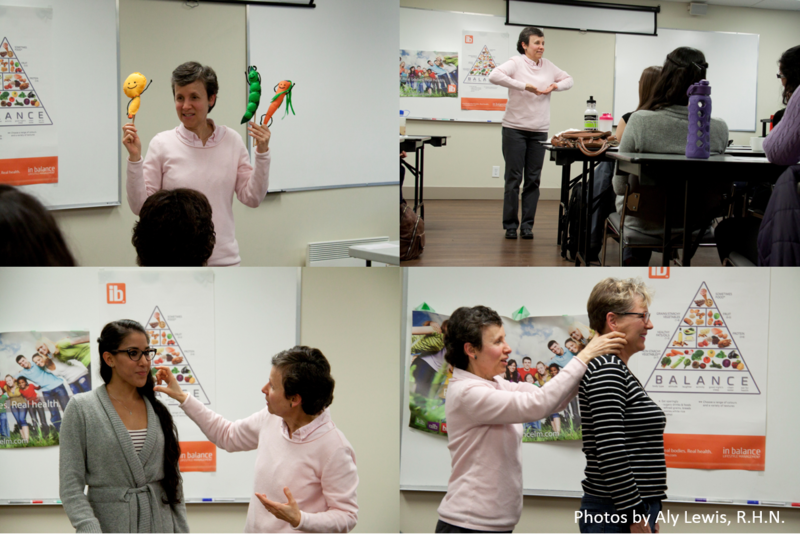 Andrea took us down the path that led her to the type of business she runs today, experiential teaching. Being a hands-on and visual learner herself, Andrea found that the more traditional 1-on-1 clinical style counseling, and public speaking without food, just didn’t fit and felt unnatural. he found that including experiential aspects (taste, touch, smell, dialogue/discussion, and reflection) the learner and the teacher are more on the same level, actively participating in the activity together, breaking down the barriers of ‘expert’ and ‘amateur’. This, in turn, strengthens the relationship with the client. Encouraging people to pass on the skills they learn is important because teaching is how learning really sinks in. Andrea then took us through making a batch of sauerkraut, and while doing a demo and talking about the process, she asked us questions about the ‘how’ (i.e. how the fermentation process works). Andrea has found that weaving storytelling into her teaching makes her experience relatable. group learning. She finds that clients and students build confidence by learning in groups. Everyone at the event definitely seemed comfortable and at ease, immersed in various conversations while working. After the fun of making our own kraut, we got to reflect on what we learned. Andrea asking these questions allowed the information to register on a much deeper level. Thank you, Andrea, for being such a welcoming teacher and speaker! At January’s networking event, we welcomed Mada Eliza Dalian, world-renowned luminary, spiritual teacher, and master of healing and personal transformation, as our guest speaker. Mada took us through her healing and transformation system called The Dalian Method. She explained that to find health you need to find your being. That there is the potential for every part of the body to have repressed thoughts and emotions blocked there. Every experience and conditioning accumulates layers which create energetic blockages that manifest as pain. Once the blockages are removed, the body knows how to heal itself. One thing I took away, which really resonated with me, was we cannot solve our problems with the same thinking that created it. Thank you, Mada, for being such an enlightening speaker! December’s networking event speaker was Kerry Vega, Success Coach and Clinical Counsellor. Kerry had some amazing advice and tips to share with us. Here are a few that resonated for me. – Start as you mean to go on. If you start out giving discounts and using a flexible fee structure, then your clients will come to expect it. Put structure in place and your clients will learn to accept it. What sets you apart and makes you uniquely different? What area do you or do you want to specialize in? – Be proud of what makes you unique and don’t be afraid to talk about it. – The more you narrow your niche, the more clients you will typically attract. You are now seen as an expert rather than a generalist. – Your niche is not set in stone. It can evolve as you evolve. – There is no such thing as competition if we are authentic to who we are. – Value your work and be confident about that value. Thank you again, Kerry, for being such an uplifting speaker! For November’s networking event, we had the pleasure of having Dr. David Wang, Naturopathic Doctor, Founder of Pranin Supplements and The Boucher Institute of Naturopathic Medicine, as our guest speaker. Dr. David discussed the wide spread stress epidemic and how it is effecting society. According to studies societies stress levels have gone up roughly 5% total in the last two years. He discussed the hormone cortisol and how it works in our bodies, including how it is released and what normal cortisol cycles should look like. Dr. David went on to discuss the different stages of hyperadrenia and hypothyroidism. Dr. David went over his nutrition and supplement protocol for reducing inflammation and restoring the adrenals and thyroid. He also emphasized the importance of stress management through lifestyle. Thank you again, Dr. David, for being such an informative speaker! For October’s networking event, we had the pleasure of having Parrish Wilson, Writing Coach and Content Strategist, as our guest speaker. Find the mediums that work best for you (blogging, podcast, YouTube, vlogging) and the distribution method (Facebook, Twitter, Instagram, Linkedin, etc). Have a goal to be building relationships with every content piece you put out into the world. You want to be making an emotional impact. Listen to hear what potential clients’ desire. This is where having a relationship is key to have people open up. I.e. send to sales page, book complimentary call, have a webinar where you pitch a sale, etc. What are you trying to sell i.e. what is the end game? Parrish has some fantastic workshops coming up, check them out here! Thank you again, Parrish, for being such a captivating speaker! – Stop blaming, complaining, and justifying your lack of business. – If you want it, make it happen. – You create your own success – no one else is going to do it for you. “Not my genius, not my job” – Sometimes saving money doing something yourself doesn’t actually save you money in the long run. Patricia is teaming up with Michelle Abraham on October 24th to deliver the one-day workshop ‘Double Your Income Doing What You Love’. Click here to find out more information. Thanks again, Patricia, for being such an inspirational guest speaker! At the July networking event we welcomed Valerie Meikle, Registered Holistic Nutritionist™ professional and Board Certified Hypnotherapist, as our guest speaker. She gave a fantastic talk on how our minds work — the subconscious and conscious mind. We learned that the conscious mind only does four things: analyses and solves problems, rationalizes, and controls will power and our working memory (things we need daily). Whereas the subconscious mind is like a computer (only acts on the programming it receives), so like a computer, the programing can be changed. Its key job is to protect us from danger — real or imagined. It is also where our emotion is. Emotional experiences and emotional connections are how all of our programming, our routines and conditioning, are created. It is also how they are changed! The conscious mind does not understand or deal with emotion. The subconscious mind is where it all happens. It is the epicenter. Thank you Valerie for your interesting talk, and to everyone who came out! We had the pleasure of having Shelley Ugyan, B.Ed, CHHC, as our guest speaker for the June Networking Event. The turnout for this event was fantastic. In fact, our best turnout yet! Thank you everyone who came. 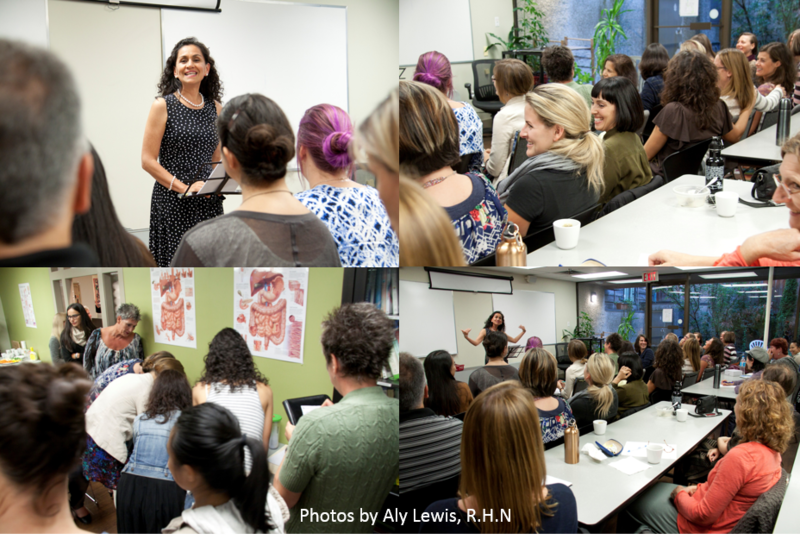 Shelley’s talk on emotional and problematic eating was extremely relevant for our Registered Holistic Nutritionist™ professionals and she shared her information in a format designed for us to use as consultants for our clients. 1. When you are conscious you have a choice. Morning meditation – This is one tool to connect with the source, with your highest energy, the place of decision-making. Learn to be conscious of your thinking as often as possible; you are able to let go of the negative automatic thoughts and replace them with this new life force energy. When you are in this connected space, you have the ability to make choices that benefit your deepest spirit. 2. Change your thinking, transform your life. 3. Plan but don’t diet – How to help with cravings step by step. A food plan isn’t a diet. It isn’t about restricting one’s food intake or about getting off any “danger” foods. It isn’t about trying to resist trigger foods or “being good” and eating only healthy foods. It isn’t a quick fix, and it isn’t a calorie-counting mechanism. It’s a tool that is changeable, adaptable, and fluid. It will be used to help identify what is working for your body and what isn’t at this time. As you work with a food plan, you will continue to grow and change, and therefore your food plan will change with time. Emotional – a person that responds to any type of emotion (usually negative) with an unhealthy eating behavior. Loneliness, anger, and sadness are common emotional triggers. Environmental – an event that has taken place in a person’s environment and is creating undesirable emotions. Behavioural – any behaviour that repeatedly causes a person to fall into an unwanted pattern of destructive eating. Examples include eating in the car or eating while standing at the fridge. There are many triggers for problematic eaters, but they all come down to thoughts that can be changed; therefore, destructive behaviours around food can be eliminated. Thanks again, Shelley, for your awesome insight! More information about Shelley’s work and her programs for health practitioners can be found on her website. 1) Set the tone before you plan too many details: Define how you want your participants to feel. This will impact your venue choice, collaborative partners, design aesthetics, promo approach, etc. 2) Tap into, or piggy back onto, built in audiences (mass) and influencers to gain momentum faster, versus marketing from scratch. 3) Take into consideration other events geared towards your target audience hosted at the same time (diluting your potential audience). 4) Have patience, events tend to build momentum in waves (unless you have strong PR before registration opens).For more information on how to “How to Incorporate Events and Social Media into your Business Strategy” click here: http://bit.ly/1RxfXZf Thanks again Sarah and Emma! You guys were amazing and are welcome back anytime. What a treat we had last night, and on Easter Monday to boot.We had over 20 Registered Holistic Nutritionist™ professionals join us for the networking event and everyone who showed up was treated to a unique and enjoyable evening. Alicia Mazari-Anderson was our speaker and she did something I don’t think any of us had done before. We started off with each of us introducing ourselves by telling the group something about ourselves that we wanted others to know. It is a great way to practice our “elevator pitches” so we are able to describe succinctly what we do when someone asks us. Alicia was the last person to introduce herself and boy she has done a lot of things. She is from Mexico and came to Canada to take her PHD (or so that’s what she told her family). That was over 20 years ago and she is still here! She got her PHD and has been teaching all over the province at a selection of Universities and Colleges. She spoke to us about a couple of people who changed her life and after listening to her, I can see why they did. She got me at “you need to figure out how to Magnetize your Audience” and then we spent time talking about how you get an audience to come to a session. Alicia was very engaging and had the attention of everyone in the room. We moved onto an activity called “reading a face” and she had us pair up and look at our partner to try and figure out what shape their face was. You can tell a lot about a person if you take a minute to look at their face and figure out their face. In very basic terms a round face = easy going person, oval = more grounded but also flexible; square face is solid and does not move, they are clear about what they like and don’t like; oblong has a bit more movement but they are still very clear about what they will do and not do; a triangular face can be convinced to change but if they tip over to a new way of thinking they can become narrow minded. We had fun working out each of our face shapes. We then moved on to an exercise where we divided the face into sections to figure out whether we were more academic, emotional, physical and whether we were right brain or left brain dominant. Finally we finished off with how a person stands. The left foot represents our purpose and the right foot our direction in life. Do your feet point forward (someone who knows where they are going) or are they pointing in different directions (like a duck) which indicates you are not clear about where you are headed, that your purpose and direction in life are not on the same path. She gave us lots to think about not only when dealing with clients but in how we conduct ourselves.We barely scratched the surface, but the exercises were stimulating and her point was you can get a lot of information about a person if you take the time to really look at them. When we’re dealing with clients, if we take the time to figure out some of these features, we will be better with our approach in treating or suggesting changes to their lifestyle.Alicia does a lot of work with a group called In Balance. For more information visit their website www.naturesheal.ca / IN BALANCE program. Kate McLaughlin, CSNN Vancouver’s Communications Manager, started off the networking event with a roll out of the new format for the networking events, giving more focus to our interactions and sharing. Kate then invited everyone to introduce themselves and their experiences, as well as introducing the CSNN Alumni Association president, Eleanor Healy, who was attending her last Vancouver event after 5 months of work in this region with the Alumni Association.At 6:30pm, Julia Oulton, R.H.N. began her presentation of two ministry funded programs she is involved with. Stay Active Eat Healthy is a program to change the kinds of foods available to children and families at public recreation facilities and schools. Focused on increasing access to healthful foods and decreasing foods with poor nutritional value. Julia presented MEND, a program focused on mitigating the obesity epidemic, targeting obese or at risk for obesity youth to make healthful lifestyle choices. From 7:15pm, the networking portion commenced giving us a chance to get to know more about each other’s projects and goals. 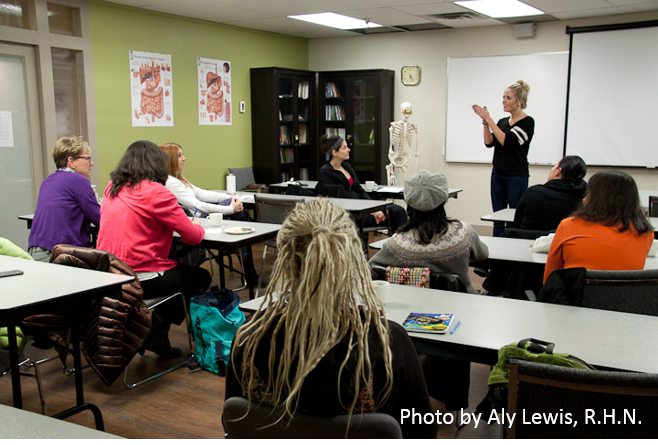 On February 23rd, we had the delight of having vibrant Registered Holistic Nutritionist™ professional and Certified Raw Foods Chef Bridgette Leeson talk about how to define our future personal objectives in the Holistic Nutrition field. All the attendees shared our different backgrounds and where we are in our lives, as well as where are we headed (from working with addictions to teaching cooking workshops) and Bridgette pointed out that, as graduates, there is no competition between us as we are all bound for different directions. On the other hand, we can find help within our community as we all have contrasting assets and previous knowledge and experience.She encouraged us to be proactive in educating ourselves, to find someone that is good at what we want to do and learn as much as we can from them. Bridgette mentioned a couple of leadership resources worth checking out: Simon Sinek’s TED talk “Start with Why” and Tom Rath’s book “Strengths Finder”. Once we find the “why”, she says, it will translate to everything we do.Bridgette talked about the importance of trying different things professionally, even if it doesn’t seem like your dream job at the moment, as this might guide us to a different field or idea that we might have overlooked. Once we establish where we want to go we need to release the fear, think big and not just be good, but be great!We are thankful to Bridgette for her refreshing and empowering talk. Click here to read the full article, including Chef Andrea Potter’s recipe for Beet Barley Risotto. A huge thank you to all of you who sh owed up to our last R.H.N. Networking Event. Your amazing attendance made the evening a huge success. We even had to bring a couple extra chairs into the classroom!And thanks to Esperanza Garcia and Eden McDonald for taking time out of their schedules to come speak for us. 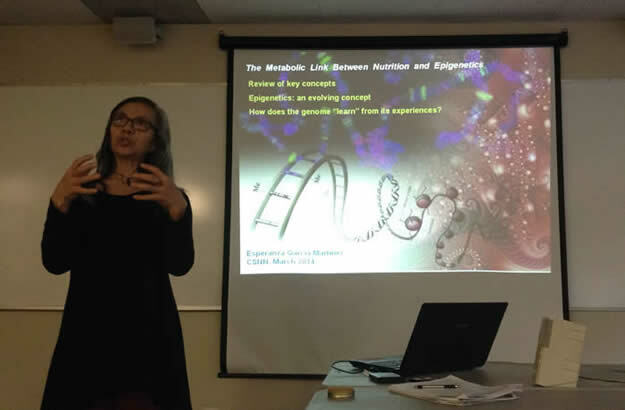 Esperanza educated us on the link between Epigenetics and nutrition. What I took away from this was to eat more fermented vegetables! And Eden shared her story on how she became a successful RHN and told us more about her upcoming mentorship program. You can find our more at feedlife.ca. 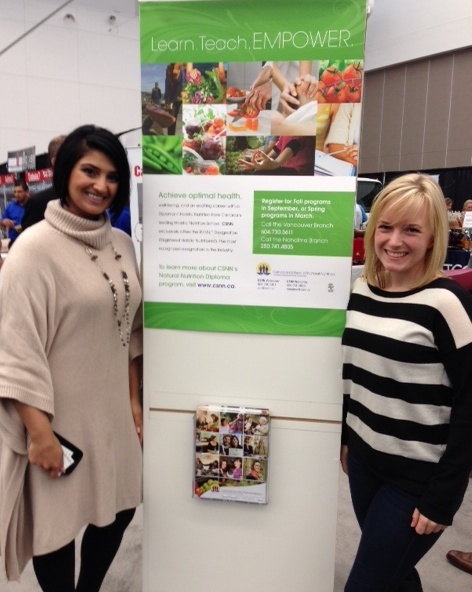 On February 14th, 15th and 16th, CS NN Vancouver spent the weekend at the 22nd Annual Wellness Show at the Vancouver Convention Centre. And what a weekend it was! CSNN Vancouver Graduate and soon to be cooking class instructor Andrea Potter R.H.N. 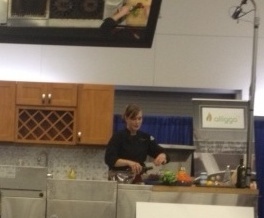 kick started the weekend with a fantastic demo of her Love Your Liver Salad at the Celebrity Cooking Stage!! 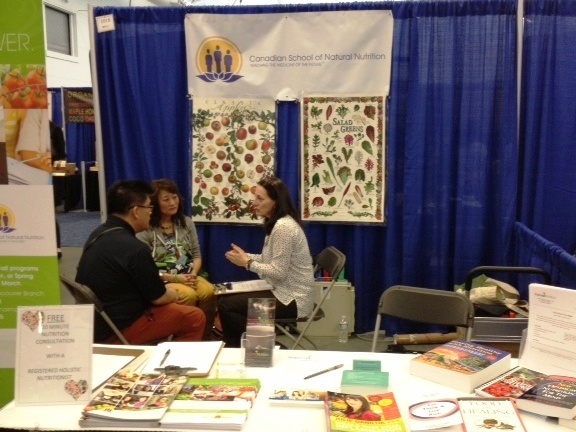 J udith, Diane and Debbie kept busy running the CSNN Vancouver booth and answering questions about our fantastic Natural Nutrition Diploma Program. While graduates Gina Pero, Sharon David, Cindy Fors and Sherry Akef, offered free mini nutrition consultations to the public and they were run off their feet! It was great to see positive feedback from members of the public who were excited to incorporate the recommendations offered to them, into their life. It was also wonderful to see so many students and graduates participating at the health show by volunteering, promoting their own business, or just attending and keeping themselves in the loop of what is going on in the wellness industry. Thanks to everyone who stopped by our booth. On Sunday, Julie Daniluk R.H.N. and author of Meals that Heal Inflammation offered a very animated and energetic talk on inflammation. 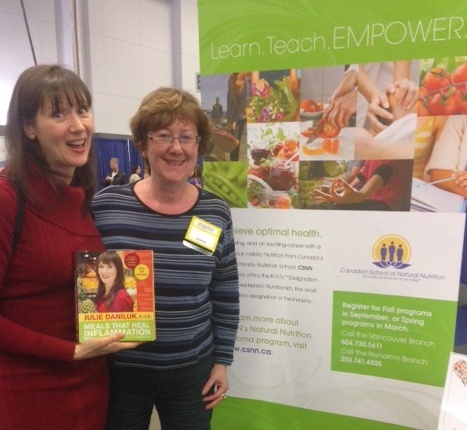 We were really excited when Julie stopped by the CSNN Vancouver booth to say hi and to “hang out with her peeps!” She is a fantastic inspiration to all Registered Holistic Nutritionist™ professionals and we were all pretty star struck! We were all exhausted by the end of it but had a fabulous time and we are looking forward to participating again in 2015! Thanks to everyone who attended the last R.H.N. Networking event. Once again it was a full house! And a huge thanks to David and Marla who came all the way from White Rock to educate us on Blending Bene and how it can be a useful tool for Holistic Nutritional Consultant professionals working with clients. You can find out more at blendingbene.com. 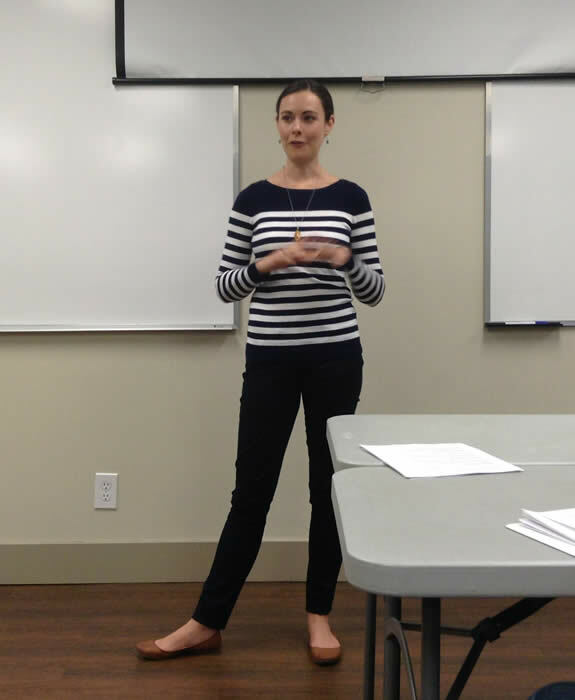 Also a huge thanks to Keyrsten McEwen for taking us through her steps to building a successful consulting practice. Very inspiring! Our second R.H.N. 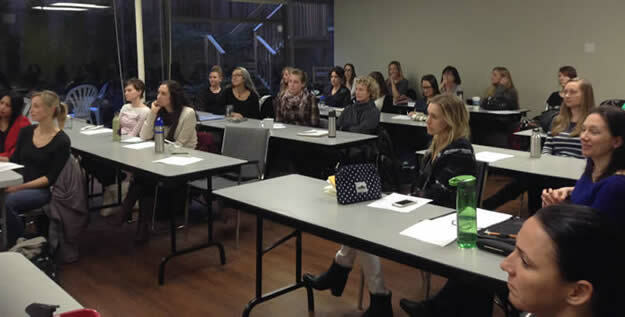 Networking Event was a huge success with 27 budding Registered Holistic Nutritionist™ professionals filling the room! 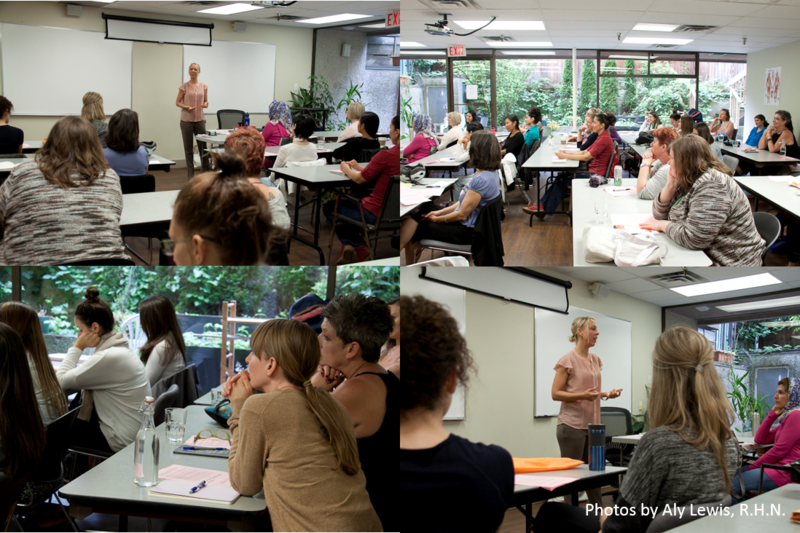 Thank you to everyone who came along, and a huge thank you to Janice Doerksen for sharing with us the intentions behind the Holistic Nutrition professionals of BC. Another huge thank you to Tova Payne R.H.N. for sharing her tips on what it takes to be successful. It was really inspiring to hear her success story and hear about her newly published book “Eat, Think & Live Rich”. It was fabulous to see so many Registered Holistic Nutritionist™ professionals networking and chatting afterwards. It is important to build community and know that we are there to support one another. 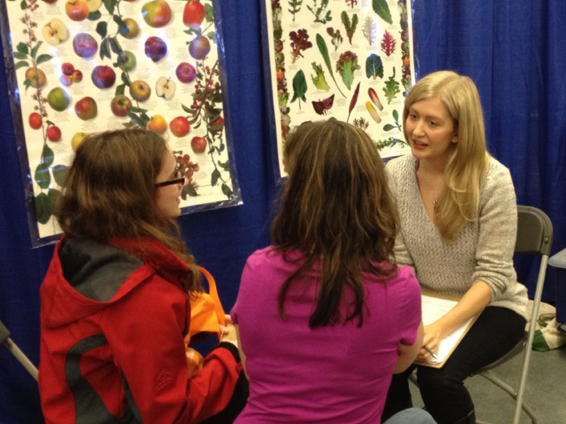 A huge thank you to everyone who came out to see us at the Vancouver Health Show on November 9th & 10th. We had the pleasure of sharing a booth with the Health Action Network (HANS) a non-profit organization that offer an online natural health resource (see www.hans.org for more information).It was a fun and educational two days of networking with other alternative health professionals and promoting the natural nutrition diploma program. We had a group of wonderful volunteers, graduates and current students, who worked hard to educate the public on the value of Registered Holistic Nutritionist™ professionals. We also had two of our graduates, Brittany Eidsness and Gina Pero offer complimentary 15-minute consultations to the public.The event was a great success and we look forward to being involved next year! This summer marked the 3rd consecutive year that CSNN Vancouver participated in this amazing paddling event organized by InspireHealth to support efforts to continue offering integrative cancer care throughout British Columbia.On Sunday, August 25, 2013, our committed CSNN team launched their kayaks from Jericho Beach in Vancouver to journey across English Bay to 3rd Beach and back again followed by a fabulous beach party with all of the participants. Our team was responsible for raising over $3,300 of the approximate $20,000 that was raised — with more funds still coming in!We’re grateful to the CSNN Paddlers team captain, Laura Hargrave-Pawson, for her outstanding work in assembling and leading the team in this inspired event. The team included Amanda Kellett, who is starting the program in September; Jen Reed, Sue Culm, and Roberta Campbell, who just finished up their school year; and Laura even persuaded her parents, Paul & Heather Kusch and her good friend, Jean Stannard, to round out the team. We wish to thank you all for proudly representing CSNN Vancouver. On February 27 CSNN Vancouver Branch welcomed Lionel Wilson, Director of Corporate and Community Relations; and Angela Wright, Head Nutritionist from InspireHealth. They spoke to CSNN students about the new health revolution! There is a changing tide with health promotion and disease prevention and integrative cancer care and integrative health care play important roles. This was the first of hopefully many talks at the Vancouver branch by this well-respected cancer care organization. For more information about InspireHealth, please visit their Web site at inspirehealth.ca.